The flame of the lighter illuminated his face as we settled onto the mats. Overlooking a pond surrounded by plants, smoke rising from the tip of his cigarette, P’Bamrung humbly began to tell the story of his life. “I am not an NGO. I am a farmer,” he told us. But to his community he is undeniably a leader, and an inspiration to other villages that strive to preserve local culture and guarantee basic human rights. P’Bamrung was born in Kut Ta Klai Village. The son of an elementary school teacher and a farmer he went through the traditional Thai primary and secondary education system and later graduated from a technical college in Kohn Kaen. After graduation he moved to Bangkok to work in a factory that manufactured parts of machines used to produce concrete. It was during the eight years that he worked in the factory that he first became involved in movements for social change. At that time, the early 1970s, Thais began demanding democracy. In 1974, following the expulsion of three dictators, a new constitution was drafted and the first democratically elected government was instated after a long period of military dictatorship. During this time P’Bamrung joined the communist party to push for better working conditions for factory workers, but, more importantly, basic human rights. He saw that workers were oppressed by large companies, such as the Siam Cement Group, and that inequality and corruption was increasing as the system was set up to fatten the pockets of those at the top of the corporate and government ladders. Inspired to act against these injustices, P’Bamrung worked with POP, People Organizing for Power, an organization that strived to put the power in the hands of the people. At the same time, however, opposition towards the democratic administration was growing as rightists instigated an anti-communist panic. The situation turned violent in 1976 when Thai military and police units killed 46 peaceful protestors at Thammasat University. Following the Massacre students, labor groups and other activists fled to areas in the jungle inhabited by the Communist Party of Thailand. P’Bamrung thought about fleeing to the jungle, but he had a responsibility to take care of his younger siblings that came to work in the factory with him. He continued working in the factory for another year, taking a three month leave at one point to become ordained as a monk, when a professor at Thamnasat University encouraged him to help with a research project commissioned by the United Nations Research Institute for Social Development. The UNRISD was interested in studying the obstacles associated with mobilizing villagers to come together to discuss community problems. To conduct the research P’Bamrung returned to Kut Ta Klai, where he started a farm and settle back into village life. In collaboration with six universities and multiple subdistricts he produced a report for the UN. The organization worked to decentralize power and engage villagers in the development of their communities; however, P’Bamrung noticed that, despite their efforts, the power and money was staying within the local government, rather than being distributed to the people. 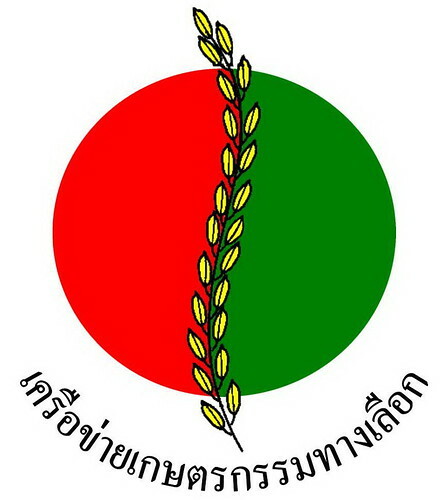 This realization moved him to run for the head of the Tambon Administrative Organization of Songkorn (TAO), a subdistrict government organization. P’Bamrung believes in the power of rural politics, and for the past 30 years has been fighting for it, but his goal has yet to be achieved. He never thought he would be the head of the TAO, but he says it was something he had to do. His mission is to create a governing structure that empowers local people, and that is not a slave to the Western ideals of free trade and consumerism. Free trade, the heart of the World Trade Organization, he explains, only benefits the bigger producer. It is driven by price and disregards quality and local production customs in the name of “efficiency” and “comparative advantage.” The only relationship between producers and consumers is, therefore, price, which sets the stage for exploitation. He envisions a trading system where both producers and consumers care about each other, and choose to partake in market transactions that benefit both parties. “It may be cheaper to buy beef from Argentina, but why should we buy it from other countries when we can produce the same products? We need to create a system of fair trade, not free trade, and take care of the needs and wants of our people,” P’Bamrung explains. “Asking Thais to participate in free trade is like having a Thai boxer fight Mike Tyson.” It is inevitable that the bigger economic power will win.